Immortalize the memory of your cat with the Whitehall Pet Cat Mini Arch Memorial Marker. The significant arch at the top of this sign offers a softened look to the piece, contrasting the rectangular sides and base. A silhouette of a cat playing with a ball rests beneath the arch, displaying your love of felines. Add a custom touch to this sign by personalizing the two bottom lines. Each line accommodates up to eleven 1.25" characters, to add your pet's name and dates. For more versatility, use the plaque as an address sign by adding your name and street address. Each marker is hand cast in aluminum from a mold made specifically for your order, creating a truly personal piece. The message on this sign will never fall off or diminish, as it is cast with each order, and the characters are easily distinguished from the background. Use the included mounting stake to place this sign in your lawn, for a dramatic marker for years to come. 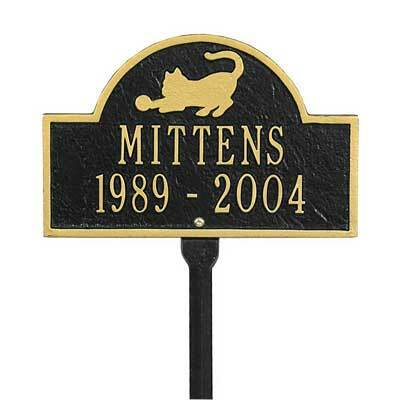 Display your address or commemorate your favorite pet with this Pet Cat Mini Arch Memorial Marker. Made in the USA. A black marker with gold characters is shown to the left using the color code "BG."